When I was a teenager, my mom would give my sister and I $25 each and take us to Ross to pick out our Easter outfits. It was one of my sister and I's favorite days of the year. We hung out in the store for hours, trying to find the perfect thing. We would look for an outfit that was spring-y, something that would look good in pictures, and something that would ultimately scream, "Easter." I know what you're picturing - bright floral dress, large straw hat, mary-janes. Well, I was looking through some pictures recently and I stumbled across a few from Easter a few years back. What was I wearing? A neon pink tank top covered in rhinestones, white capris and flip flops, of course. Klassy. I don't go shopping for Easter outfits anymore, but I think that is probably for the best. I did finally wear my mint top for the first time. Will I look back at the pictures and cringe? Maybe. But at least there isn't a rhinestone in sight. What a funny story! I'm pretty sure most of us have a few rhinestone skeletons in our wardrobes (I may or may not remember my own :) You look absolutely fantastic in this outfit, though: it's chic, simple and classy, and I'm sure you won't cringe because of it anytime soon! I'm so happy I've discovered your lovely blog! Definitely adding it to my daily reads! I'm so glad you're here, Ivana! That is hilarious, so funny to look back on, but I bet that rinestone shirt was totally cool when you bought it. I really like your outfit. 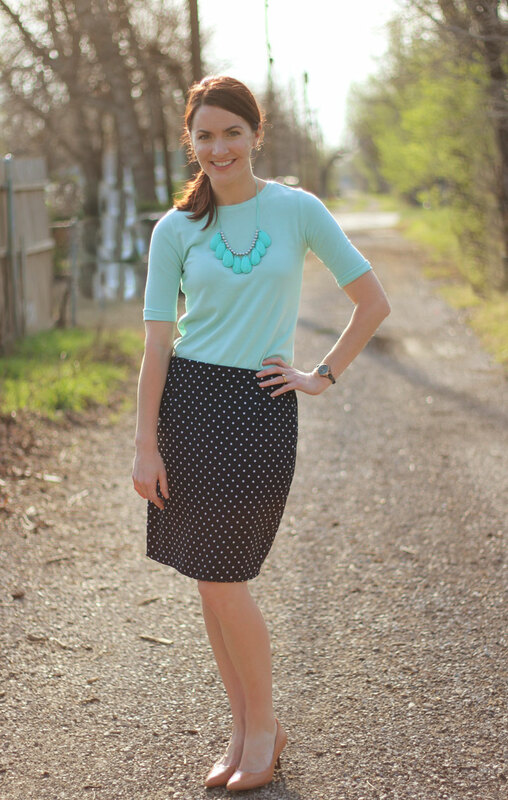 I wouldn't have thought to combine the mint top with the blue skirt, but it looks great. The pictures are seriously so funny! Thanks for the compliments - I was so happy when things I already had in my closet turned into a cute Easter outfit! Very cute outfit! Your story is too funny! I look back on my pictures too and am like "what am I wearing", but it's funny too. Haha it so funny to look back on, isn't it? I can't wait to have my future children look back with me and laugh just like I did with my mom's clothes! OMG, that sounds like so much fun!!! I will have to keep that in mind when we start a family :) I love that idea!!!! I think this outfit is so classy and adorable! Mint is one of my new favorites! So far all I own is this top, but I'm sure there are more mint items in my future! I love the mint with polka dots! Such a great Easter look! I like this outfit and I also meant to tell you that I liked your outfit last night. I loved the boots and the dress! Haha, I like that idea! Thanks, Danaegous - I thought of you when I wore my Hunter's! What a lovely Easter tradition, great to have memories like that. Your ensemble definitely screams "Spring" and "Easter." Those colours really suit you too. Beautiful photos! Thanks so much Willow! It was a fun tradition! That is such a sweet story about you and your sis. What a darling memory! I am so glad I will always have that Easter memory! I don't think you'll look back at this and cringe! It's so classic with just enough 2013 sprinkled in that you'll be proud of what you wore. promise! You are adorable! I love the mint top! Aww haha I used to HATE the Easter dresses my mother picked out for us as a child but it would have been so fun to get to pick out your own outfit! I love the mint top and I'm sure you won't look back on this one and cringe! It was fun to pick out the outfit, but it had to be so tough for my mom to watch us pick out rhinestone tops, hah! hahaha! i'm trying to imagine you in a rhinestone tank top! love this look on you though, it's so classy and that necklace is SO pretty! I know, right?! That is just so far from anything I would ever wear now! What a great memory! I love this top with the mint necklace - it adds an extra layer of dimension to your outfit without adding more clothes. Thanks Alice! I was so excited that the mint top looked good with the necklace! I really like this outfit! The shirt is such a pretty color and I like the neckline and sleeves. Nothing wrong with a few rhinestones here and there. ;) But I must admit, I'm more of a fan of your current style myself! ha! Love this! 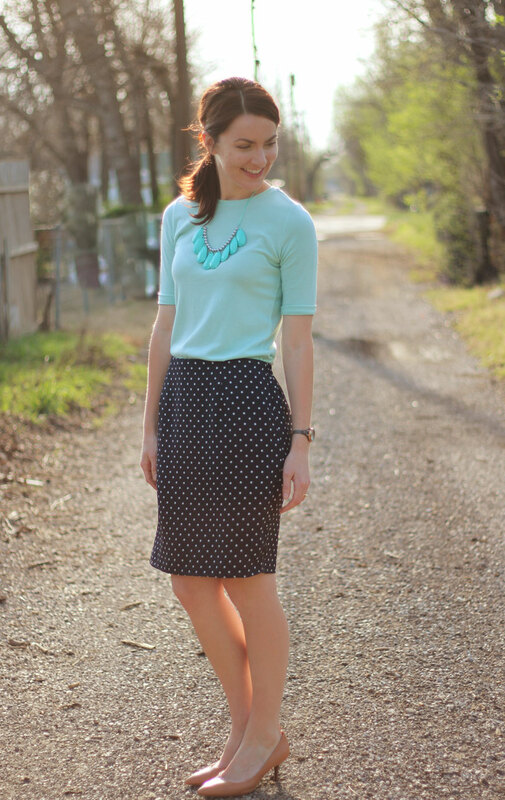 Your skirt is adorable and compliments the mint tones! I also love the tan heels, they're simply adorable! My mom would have us girls pick out outfits too, it was always the best art of Easter, besides the candy, of course! Thanks - the heels have been an awesome addition to my wardrobe! Thanks, Elana! I am so glad you're here! Thanks for sharing that story. I am sure your mom and sister have equally fond memories of that day and/or the outfits. I love what you wore this year. 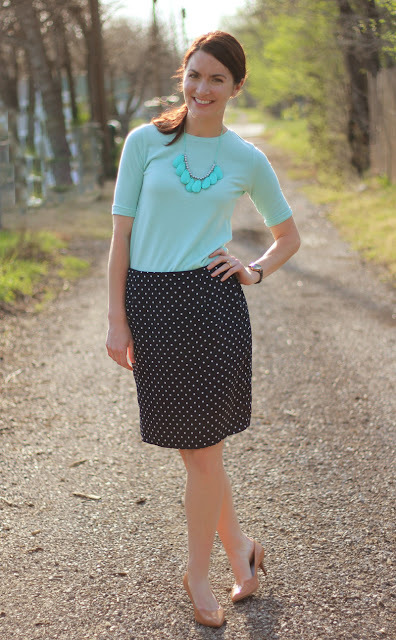 Mint and polka dots make the perfect combination! They were such good memories! Thanks so much, Karen! for my 8th grade confirmation, my mom told me she would make me a dress of my choosing. i chose a pastel polka dot peplum dress with ruffled cap sleeved and a mock turtleneck. so there's that! you look great in this classic outfit. i love the colors together and your necklace is so pretty! have a great weekend! Haha I don't even want to know what I wore to all holidays past. I love your outfit here though! 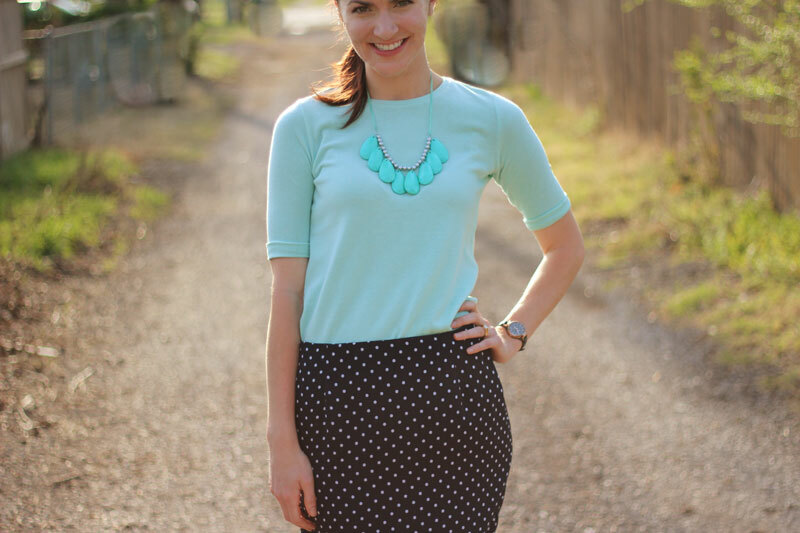 I'm a sucker for polka dots, and the top and necklace go together perfectly! I was so glad I stumbled across that old pictures - I had no idea before what I had worn! So fun to look back! Thanks, Danielle! I'm so glad I found this skirt while thrifting - I seriously wear it all the time! I LOVE mint! This is a great outfit for any spring or summer event! It's definitely a new favorite color! wow I am so glad I found your blog! I love it! You have such sophisticated and adorable style. I need a classic fitting shirt like that that you can wear with Everything. ANd wow that skirt was Thrifted?! I just got one like it at Target for I'm sure much more than you paid! Nice job thrifting :) following you now! Thanks so much, Sara! You know, I love the top so much that I'm thinking about going back for more colors! Love the look, especially the skirt! Love love love this pairing! What a gorgeous necklace!